Molds for R1 and R2 of B CODE were formed by Subtractive Manufacturing processes, first with a laser cutter then a 5 axis CNC router. The 3D printers I have designed take the principles of additive manufacturing and pushes the technology further, towards a more sustainable and ecologically friendly method of printing forms. B-code is revolutionary in that prints are made using a biopolymer that is fully edible, biodegradable, and completely sustainable, without dependency on petroleum, emitting no carbon, and producing no waste. Bees work using a simple logic similar to codes used in modern computing, including binary code, if-then statements, and go to statements. I call this set of instructions B Code. The set of feedback signals that prompt bees to begin building comb include triggers such as a nectar flow, when the amount of available nectar exceeds the demand of the population, and that population begins to grow as a result of those extra resources. The first signal of a nectar flow is crowding, a binary yes or no output. A Yes output results in the next set of choices, and those are determined by a set of programs that are very deterministic and difficult to change. Distance to nearest comb, depth of cell and cell width are determined by algorithms generated by the dimensions of the bees themselves, a truly Vitruvian architecture. The space between combs equals the distance a bee can reach from where she is standing, known as Bee-space. Cell widths are determined by bees measuring with their forearms, and the depth of cells are determined by Queenlength, the length of the queen's abdomen. Building comb is just one of many tasks performed by bees, who take on various tasks as guilds, these guilds malleable and determined by factors including age, resources available, and population. Bees will also repair damage to their honeycomb and improve its structural integrity over time, which is how I came to this series of works, where I modified existing comb and then inserted it back into the hives for the bees to finish. I needed a mold to keep the bees on my seed prints and prevent them from doing that they do, which is sting intruders. I also wanted to document the comb-building process, so I set up experiments to see how easy it was to photograph bees behind a glass wall. This proved nearly impossible. 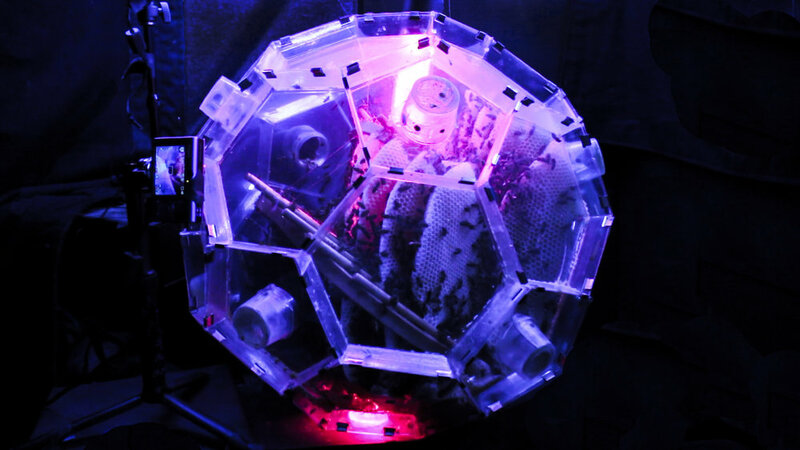 The first prototype included a camera housed inside the hive cover. Putting a camera in a hive is problematic, as you may guess. Bee hives occupy a certain volume, and that volume is determined by thermoregulation rules for the size, material used to house the bees, and the strength of the hive population. We're talking volumes around 5 liters. This makes it tricky to get a camera inside and still maintain an optimal focal point. Plus, the camera has to be sealed in the hive so bees can't escape. R1 turned out to be a failure when winter rains caused massive condensation on the acrylic box and started to drip down onto the bees. So I scrapped the idea of putting the camera inside the hive, but then had an idea- what if we light the comb from the inside, as I had done with the sculptural pieces? This would help reduce the terrible glare I'd been getting before from the acrylic. This is how the idea for the bubble dome of Version 2 came to be, since spheres are the least reflective of forms. This allowed me to pull the camera from the hive for full freedom of movement and maximum potential for catching the building of honey combs in progress. B Code version 2 was formed by pulling PETG plastic over two half-dome molds in a vacuum former, then assembling the two halves to enclose the hive. While version 2 was lovely in its clarity and form, this proved difficult to reproduce, difficult to maintain the hive (there were no ports to reach one's hand into) and difficult to assemble. Bees require approximately 5 liters in volume for the best thermoregulation and honey production, and I needed some way to contain that volume in a way that could be disassembled when not in use. Adjustments would need to be made, queens to catch, and various other "beekeeping interventions" that require being able to open the forms to get to the bees. Version 3 was inspired by a fellow artist at Autodesk's Pier 9 workshop, who made a curving wall of plywood by assembling many small pieces in a faceted pattern. It made me stop and wonder if I could facet my round form, and that first thought immediately conjured up a Buckyball. After researching this truncated icosahedron from, I concluded that it would indeed be the optimal choice.